The Mandap or the Manavarai is the mainstay of Hindu weddings. It is where most of the wedding action takes place anyway. Anyone who has been to a Hindu Wedding will be familiar with the decorative wedding canopy supported by four posts, adorned with flowers and hangings. The bride and groom along with their respective families are its principal occupants along with the priests performing the wedding rites. Present day weddings are following exciting trends when it comes to decorating the manavarai. A lot of couples are going for a modern and a more contemporary approach to mandap decor to match their aesthetic sensibilities. 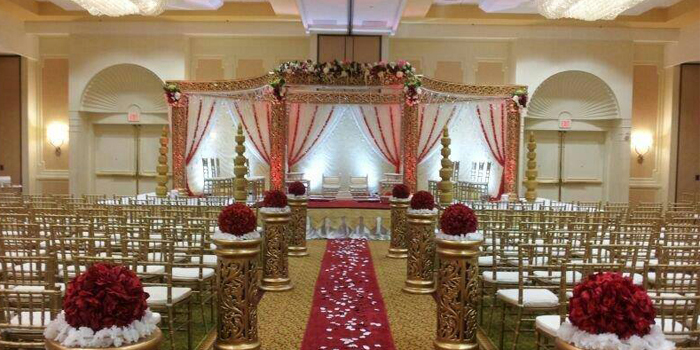 Traditionally, the mandap is made of organic materials such as wood, bamboo or plantain stems or even sugarcane. However, we are now seeing the usage of curtains, lights, crystals and elaborate floral structures in the decoration of the mandap. But whatever the decor and design may be, marriage planners should keep certain features of a mandap sacred. Here is an elaboration on each part of the mandap and the significance they have on the lives of the bride and groom. The four columns that hold up the corners of the canopy signify the four stages in the life of a man according to the Vedas – Brahmacharya, Grihastha, Vanaprastha, and Sanyasa. The pillars stand as mute witnesses as the groom makes the transition from Brahmacharya (Bachelorhood) to Grihastha (Family Life). Another interpretation imagines the four posts to stand for Dharma (Morality), Artha (Prosperity), Kama (Love), and Moksha (Liberation) – the four pillars that need to form the foundation of any marriage. The top covering of the mandap along with the stacks of brightly coloured earthen pots filled with water in the four corners represent the five elements – Earth, Fire, Water, Air, and Space. The combined power of the Pancha Bhootas is believed to make the wedding ceremony all the more auspicious. The floral adornments and thoranams (decorative hangings) in brilliant shades of red, yellow, and green, denote blessings of prosperity and bounty provided by Nature on the newly wedded couple. The Fire or Agni symbolizes purity and bears witness to the marital union of the bride and groom. It is believed that the promises they make to each other with the ceremonial fire as a witness will remain unbroken till death do them apart. The Kalash is a ceremonial pot that performs a central role in many Hindu rites and rituals. It is typically made of brass or silver, filled holy water and symbolizes the human body with the water standing in for the soul. Five mango leaves representing the five senses are arranged along the rim of the pot and topped with a coconut that denotes the human mind. The Poorana Kumbam, as it is sometimes called, is thus a representation of the interplay between the human body, mind, soul and the five senses. Wedding organisers in Chennai would do well to keep these principles in mind when they are designing the wedding mandap decor. So, the bride and groom can get the most auspicious start to their married life! PreviousHow To Choose Your Wedding Venue? Tips From An Event Planner!NextAwesome Tips To Decorate Your Wedding Reception Venue!